Nicky applies her trademark creativity to more than thirty scarves using a wide spectrum of techniques—felting, Fair Isle, florals, embellishments—as well as simple stitch patterns. 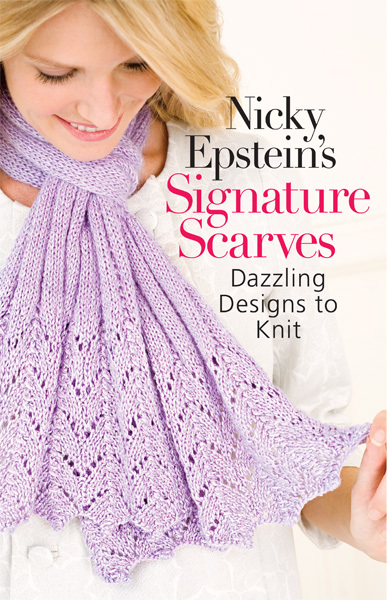 No knitter will want to be without Nicky Epstein's Signature Scarves. Inside you will find patterns to delight and inspire—from a fabulous tweedy wrap with appliquéd leaves, to a scarf composed of bright circles, to a mosaic piece that, upon close inspection, sports rows of tiny skeletons! Both beginners and advanced knitters are sure to find designs to spark their creativity amid the full range of styles and knitting techniques!